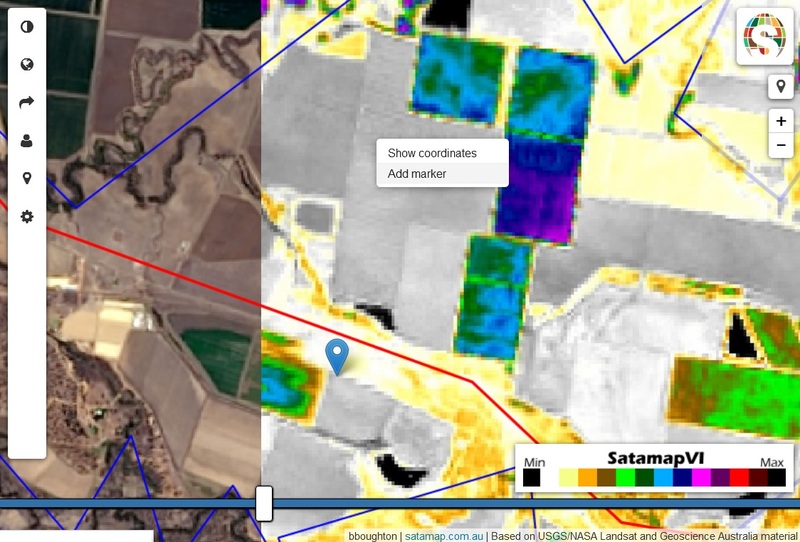 Satamap is a web based satellite imagery service for precision agriculture. It’s available at satamap.com.au. This is a project I am part of so the following is not an independent review, just a quickly written explanation of this innovative app. I understand my audience is fairly schooled in most things precision agriculture so I’ll skip the marketing talk and get straight to the point. Today we are launching Satamap. This is a brand new service making up to date satellite imagery available to everyone. Our focus is on agriculture, therefore all imagery is paired with a vegetation index called Satamap Vegetation Index (SVI). It is similar to NDVI but we believe it is better at showing variability in high biomass crops and less impacted by soil colour. The colour ramp we use to represent the SVI values, while in your face at first, is designed to show biomass variability in all crops, at all stages of crop growth at all times of year. The colours remain consistent year round so that, for example blue represents the same as blue and red, red no matter which location or time of year. This is important because the Satamap slider allows any two image dates to be laid over the top of the other and the ability to slide between the two for a direct comparison. The same can be done with the standard colour imagery as well. This service does not require drawing in of paddock boundaries or limit you to a small area of interest. Subscriptions are based on a 3 million plus hectare tile. It takes 5 minutes to subscribe and you have access to the whole area and an archive back to winter 2013. Imagery is captured at a 16 day interval. Cloud can get in the way at times which can be frustrating but we are working on increasing our imagery availability to reduce cloud impacts. The colour imagery has a resolution of 15 m and the SVI is 30 m. We cover all major cropping regions of Australia. Satamap works best in an iPad or similar tablet device, but functions equally as well on a desktop computer. Other standard features in Satamap include custom markers, area measurement tools, imagery export and GPS location on the map. All these features themselves could warrant an article, but best to just watch the video to see some of them in action. Satellite imagery has been available to agriculture and related industries for decades and those that have invested the time and money will attest to the value and significance in this technology but admit that all too much the time and money is often the biggest hindrance. We are aiming to solve these problems with Satamap and bring out the potential of satellite imagery for agriculture. Agronomists, grain traders, farmers, suppliers and more can all benefit from rapid, cost effective access to up to date satellite imagery. We are in constant development. We are working on offering higher resolution imagery, ground truthing data points, exporting with post-processing and more. Currently only available in Australia, very soon we will be opening up to other parts of the world. Thanks for checking in. Please check it out at satamap.com.au.